Old woods road meandering to Bessie's Point overlooking Fosters Pond. Some of the trees, rhododendrons and laurels growing along the roadway in Goldsmith Woodlands were planted by Bessie Goldsmith herself. Note the avenues of black pines, so dense that few plants can grow beneath them. 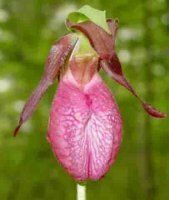 Lady slippers abound here in late spring and other plants rarely seen are visited by Harvard University botanists. The marshes adjacent to the pond are home to cattails, pitcher plants, sundew, snapping turtles and Great Blue Herons. The uplands provide habitat for resident deer, fisher, fox and wild turkey while owls patrol the margins. Goldsmith Woodlands is rich in history. Relics of an Indian encampment have been found near Foster's Pond and a large number of projectile points (arrowheads) have been discovered north of Foster's Pond in Ballardvale. Foster's Pond was probably named for Andrew Foster, the 22nd man to settle in Andover. He died in 1685 at the age of 106. His wife, Ann Foster, was one of 41 people accused of witchcraft during 1692 and 1693. The elderly Goody Foster was imprisoned in a tiny jail cell in Salem during the hot summer months. She died there after 21 weeks of confinement. Originally, Fosters Pond was much smaller in size than it is today. 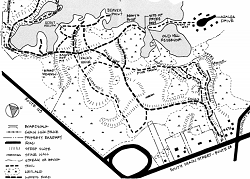 The pond's holding capacity was increased by the mill owners along the Shawsheen River in Ballardvale, Andover and Shawsheen Village by constructing a dam at the end of Bessie's Point. This impoundment was known as the "Old Mill Reservoir" whose water was released to augment the flow of the Shawsheen River in drought periods. The mills were dependant upon the power of the river current’s energy. In time, the mill owners determined that they needed to detain even more water for their use and built the dam that is presently visible from Rattlesnake Hill Rd. An 1830 map shows the Goldsmith family as owners of the woodlands. During the early 20th century, Goldsmith Woodlands were a favorite summer retreat. Bessie Goldsmith collected rent from those who had cottages on her land. Cellar holes and swing hinges on trees are still visible. One of these cottages belonged to Zack, a caretaker of these woods and a handyman for the summer residents. His name lives on in the designation of Zack’s Way, Zack's house and Zack's hop pit. Stories about Bessie Goldsmith's somewhat eccentric behavior in her devotion to protecting her woodlands are legendary. She lived in a rustic cabin on a knoll overlooking Foster's Pond on what is now called Bessie's point. She was known to point her shotgun at trespassers and if she caught people picking blueberries, she demanded they turn the full pail over to her. In 1974, Bessie Goldsmith, a dedicated conservationist, donated her woodlands and land inherited from her brother Clarence to the Fund for Preservation of Wildlife and Natural Areas. AVIS became the caretakers in 1977 with funds given for maintenance out of Bessie's trust. In 2001, AVIS acquired 491 South Main St. to increase the available parking at the entrance to the Woodlands. Between South Main St. (Route 28) and Fosters Pond. 491 South Main St., diagonally in the front yard.